If you could measure video in words, how many words would be one minute video? The answer is 1.8 million. According to the research by Dr. James McQuivey of Forrester Research this is its equivalence. So, are you still thinking in leave video out of your strategy? If the answer is yes, perhaps you should consider the following factors. Everyday online video is more and more present in the contents seen by users. 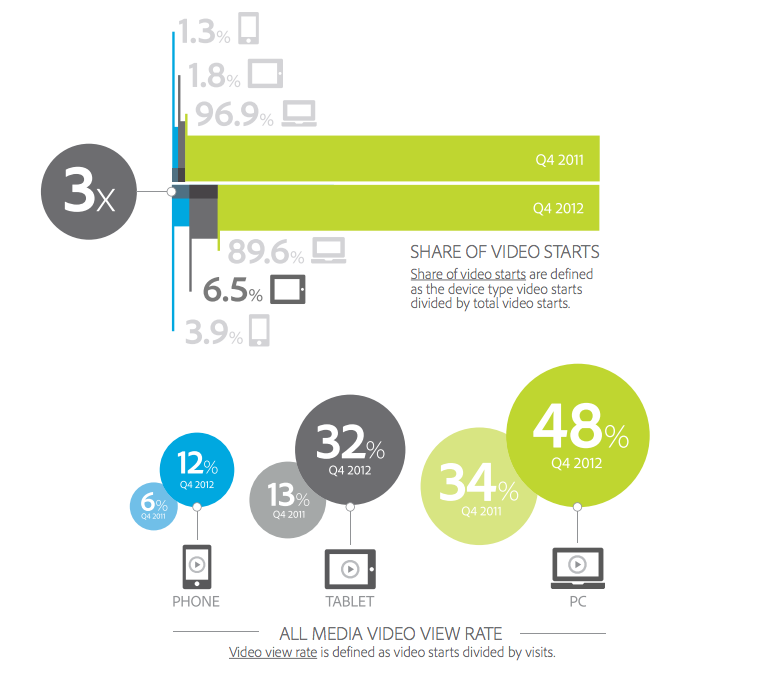 In one year, from may 2011 to may 2012, online video consumption grew an amazing 30%. And due to a Cisco Research, by 2015 online video will 57% of the Internet traffic. Attending to this numbers, is not strange that Youtube reached more than 1 billion unique users each month and showed over 4 billion hours of video each month. But this data also warn about how the competition is becoming harder. Videos can´t be good any more. Now videos must be unique. And that´s is forcing marketers to be more and more creative. Unlimited mobile broadband or cheaper plans depending on the country is also pushing online video. Users spend more time using their mobile devices. This is one of the reasons that explains why mobile video views grew by 300%. And also users act in different ways depending on the device they use. Tablet users tend to complete a video in comparison with smartphone or pc users. Gangnam style and Harlem Shake are two of the most recent examples of how viral video acts. Today we share video in a different way than not so much time ago. Do you remember when you emailed your friends to share content? Today social media networks make sharing easier, faster and more effective. Only with a couple of clicks we can share a video with hundreds or thousands people. That´s another big reason to consider online video to push the online marketing strategy. Do you agree? Do you use online video actively in your online marketing strategies?